I personally think these are the most important and critical SLR macro photography tips that anyone interested in macro photography should know about. In Full Flash Photography, very little or no ambient light is captured, all the light is supplied by the flash/speedlight, hence the name Full Flash Photography. My typical full flash photography setting is 1/200, F11, ISO100, ETTL with -1 FEC. At this setting, without flash, all you capture is a dark or near dark frame. Please check out Fill Flash vs Full Flash Photography for more details. At first glance, these macro photography tips may sound very complicated but just be patient and read through this post - you will benefit from it tremendously. Full Flash photography is great but you have to diffuse the light really well in order to get that nice soft light. You will notice that your full flash shots are generally sharper than your natural light (no flash) and/or fill flash shots. This is because in full flash photography, you are using the short flash duration to freeze motion, whether that (the motion) of yours or the subjects, or both. 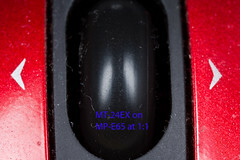 For my full flash 1:1 macro photography, i normally use this setting: 1/200, F11, ISO100, diffused MT-24EX on ETTL with -1FEC. I dial in more -ve FEC if the background is dark/black/no background, and reduce the FEC (i.e towards +ve) if the background is bright/white. You don't really have to know how a flash/speedlite work, but you should know that the flash intensity is constant. So if you need more light, the flash simply stays on for a longer duration. In full flash, since all the light is from the flash, your flash duration will be your virtual/actual shutter speed! Here's a bit on info on SB800's flash durations i obtained from: http://www.scantips.com/speed.html . You don't have to remember the numbers, but you do notice that as you use higher flash output/power, the flash duration is longer! And as you reduce the flash output/power, the flash duration becomes shorter. Here is similar flash duration data I found for a 580EX II (from http://www.rodandcone.com/2008/05/flash-durations-for-canon-580ex-ii-and.html). Again, you can see the same trend: higher flash power/output, longer flash duration. So it is clear here that we should use as low a flash power as possible to achieve really high shutter speed, as higher shutter speeds normally translate into sharper images. Just an example to make sure that you really get the point: again, let us assume the same typical full flash setting of 1/200, F11, ISO100, but say we set the flash to manual 1/4th power on a 580 EXII. At this power setting, we can see from the table above that the flash duration is 1/8447 sec. Although the shutter is open for 1/200 second, there's no light coming in. The only light is provided by our flash, which stays on for only 1/8447 seconds. So what is our actual shutter speed there? 1/200 or 1/8447? Well, i am sure you get the answer right - 1/8447 seconds! In English, basically it means that if you reduce the flash-subject distance by half, the intensity will increase fourfolds (4 times!). In other words, by bringing your flash closer to the subject, your flash doesn't have to work as hard i.e shorter flash duration ie higher virtual shutter speed. Example: if you need full power (1/1) at 8" working distance, at 4", you'll only need 1/4th power. Less power is good as it means shorter flash duration thus higher virtual shutter speed. Looking at the flash duration table for a 580EXII above, that would mean shooting at 1/8447 (1/4th power) instead of 1/871 (full power). So which shutter speed do you prefer? 1/8447 or 1/871? 1/8447 for sure! It's a no-brainer isn't it? This is also why a lens with short focal length is better for full flash photography. 50mm, 60mm, 90mm, 100mm, 105mm. The longer ones, 150, 180, 200 are more meant for natural light/fill flash photography. But of course, you can always use a flash bracket to bring the flash really close to subject and still get good light out of it. No one explains it better than Mr. Strobist himself so go read it there. A few images to make it easier for you to understand and grasp the concept of "Apparent Light Size". 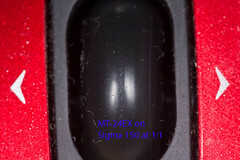 Please also read MT-24EX on Sigma 150 and MP-E65 if you need to know more about apparent light size. Pay attention to the the twin specular highlight/catch lights on the scroll wheel, and also the SIZE of the specular highlight. You will notice the trend: as the working distance reduces, the catch lights get bigger in size and the specular highlight becomes less harsh. 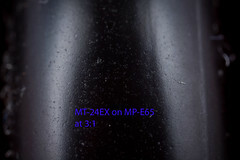 Right: The same diffused Canon MT-24EX Macro Twin Flash on the MP-E65 at 1:1, working distance: 4"
The same light/flash setup gives me different result at different working distance of 7.9" vs 4". Needless to say, the light is better at 4". Note the less annoying highlight and the relatively bigger "catch lights" on the scroll wheel on the image on the right. That's what we mean by "Apparent Light Size". 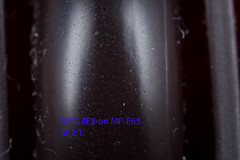 Right: same diffused MT-24EX on the MP-E65 at 3:1, 2" working distance. The light was great at 2.5" working distance, but even better at 2" working distance! Also note the even bigger catch light on the scroll wheel. Again, "apparent light size"! These three important facts are the reason why in full flash photography, you want your light source to be as big and as close to the subject as possible. That's when a flash bracket comes in handy, especially when it comes to higher magnification where every slight movement is more amplified. That's the reason why i use a diffuser like this for my bracketed 580EXII and it's basically resting right on the front of the lens/filter. 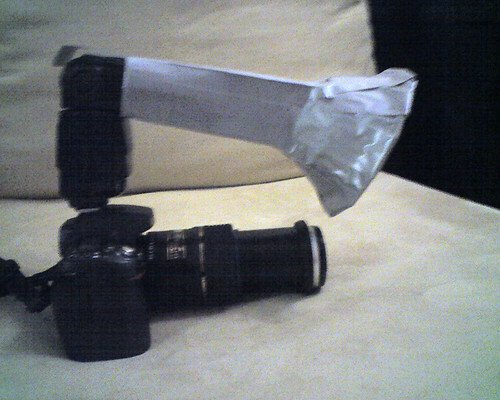 For more info, check out my other post: My Macro Rig. Lumiquest Softbox. Click image to view more details. 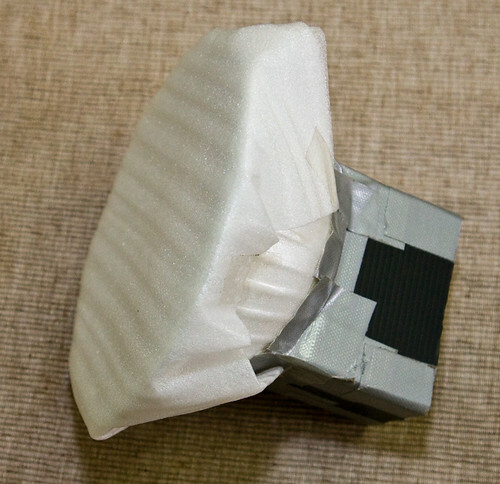 Check out how i DIYed the snoot diffuser in the image above here. A light weight but still powerful 270EX will suffice as long as you can bring it close to the front of the lens, near the subject. Check out this post to see a few great sample macro rigs. That's it for the full flash macro photography tips. A bit lengthy but you really have to know all these in order to design/DIY a diffuser that will give you good light in your full flash macro photography. Finally, whenever the natural light is good, which occurs normally either early in the morning, late in the afternoon, or at least under shade or during gloomy/overcast day, don't forget to just turn off your flash and experiment with natural light. Check out more info here. Thanks for your sharing here and i learn alot from your blog. Very informative. Good job Sifoo Kurt.